This game helps make articulation therapy fun! 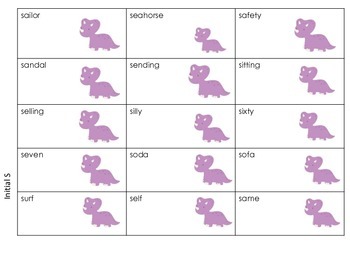 It includes 45 stimuli cards of /s/ in the initial position, 45 cards of /s/ in the medial position, and 45 cards of /s/ in the final position of words. Have students take turns spinning the spinner and picking a card. 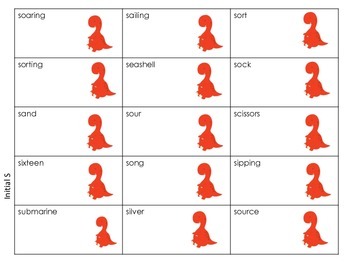 Have them say the word on their card in isolation, in a phrase, or in a sentence the number of times indicated by the number they spin. Then if the picture on their card matches their mat, they get to keep the card and pick again. If it does not match, they put the card back and it’s the next players turn. 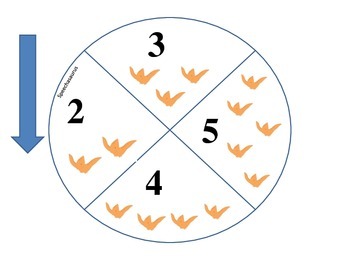 First person to collect 5 dinosaurs and fill their mat WINS! This game can be modified to take longer/shorter depending on the number of mats and cards you choose to use! 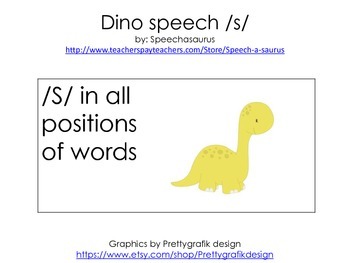 This packet includes 3 pages of /s/ initial word cards (45 cards), 3 pages of /s/ medial (45 words), 3 pages of /s/ final (45 words), one page of wild cards (9 cards), one dinosaur spinner, and three game mats.